Do you remember the KIA commercial from last year’s Super Bowl – the one that featured life size versions of the Yo Gabba Gabba gang and a sock monkey? Well, my husband was infatuated with that commercial! My favorite part was the sock monkey and now I seem to be infatuated with everything sock monkey. So when I saw today’s Real Party I was instantly in love. 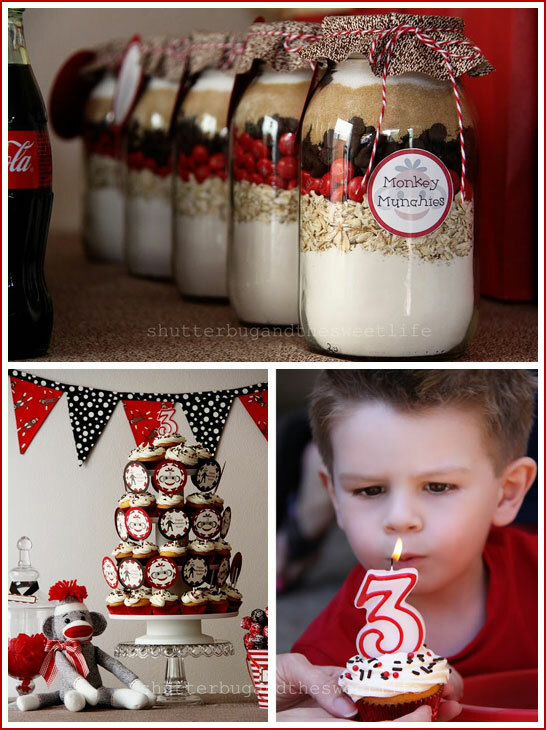 Take a look at this adorable Sock Monkey Birthday Party by Jennifer of Shutterbug and the Sweet Life. I just love this party to pieces! 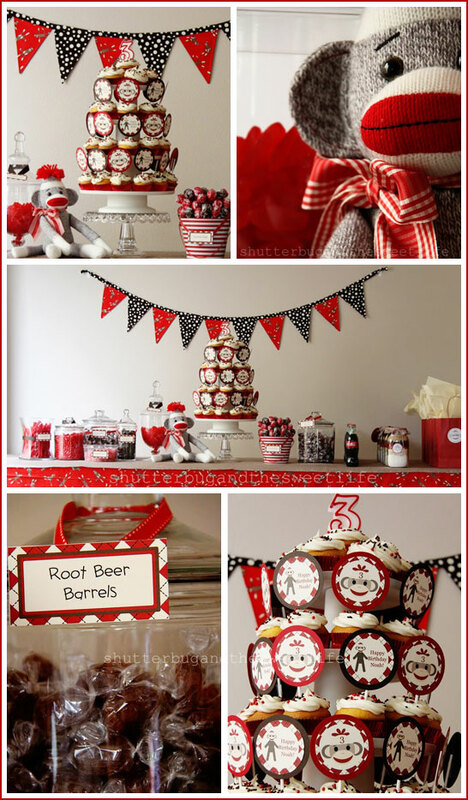 Everything from the bunting to the cupcake toppers is sock monkey inspired. The ‘Monkey Munchies’ are such a cute favor and the glass Coke bottles fit in perfectly with the color scheme and retro feel. Kudos to Jennifer on party well planned! You can read more about this charming Sock Monkey Birthday Party on Jennifer’s blog, Shutterbug and the Sweet Life. And if you’re still wondering about the KIA commercial… you can find it here. Enjoy! I LOVE THE SOCK MONKEY!!!! I HAVE GOTTEN SO MANY GREAT IDEAS FOR BIRTHDAYS!!! I AM TRYING TO DO ALL MY FRIENDS/KIDS BDAY PARTIES NOW!!! How funny – my boyfriend loved that commercial too! Cute party!! What an adorable party! Everything is tied together so well and the party guests are sure to love every last bit of it! cooo cute! the favors are perfect! Your pics of the sock monkey party are great! I’m doing the same theme for my one year old son. I was wondering if you could tell me what the recipe is that goes in the jars to give out as favors? Hope your party goes well! Happy Birthday to you son!! Just thought I would pop in and answer Natalie’s question (a little late though!) I made the printed tags and banners myself in photoshop! : ) Hope that helps! Thanks for all the kind comments! It was a fun party! Hi! I also tried to visit the link posted to read more, and it is not accessable. Could you tell me where the creator purchased the banners, cake toppers and labels? My sons first birthday is coming up and this party is my inspiration. Ugh. Just read that she printed them herself. Sorry for the repeat. Is it possible to get in touch with the person that made the labels on the jars? I’m interested in the sock monkey label that says monkey munchies. I would love to buy some. can you give us the “recipe” for the monkey munchies jar? El – you can find the recipe for the cookie favor jars here on Bakerella… just swap out the color of your M&M’s! Le-I’ll be creating some labels for my son’s first birthday soon. Do you still need labels? How much for the labels?? My sons bday is in March and I am using this theme. Thanks!!! The hostess of this party made the labels and banner herself, in photoshop. I do not believe they are for sale. However, you can find printable sock monkey party packages HERE on Etsy from other vendors. Happy Shopping! I would like to have the file for the “monkey munchies” label on the jar if anyone has it! Thank you so much!